You’ve Probably Never Had Pasta Quite Like This Before…. In our experience, it’s really easy to get stuck in a pasta rut, making the same old spaghetti and meatballs or lasagna. Don’t get us wrong, we love all things noodly, but this dish is unlike anything else we’ve ever made with pasta! And it’s a great way to use our springform pan for something other than cheesecake…. It really is super fun to make, and our kids love helping squish the cheese and sauce into the upright noodles. And when it’s done and we slice into it, everyone is always impressed – it looks that good! 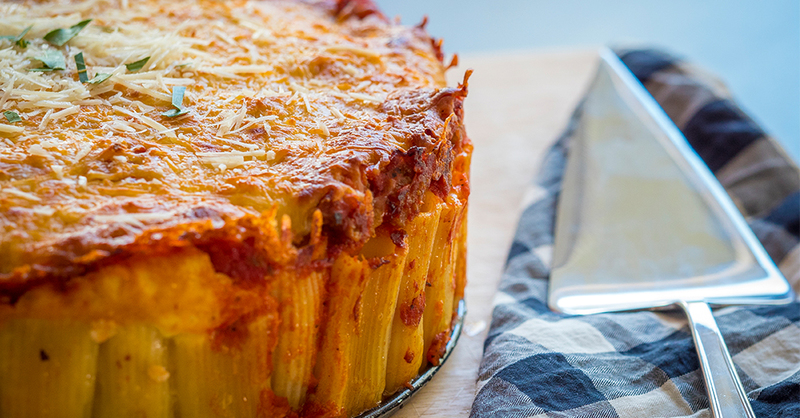 So switch things up the next time you’re craving pasta, because there’s nothing boring about rigatoni pie! Preheat oven to 400º F and lightly grease a 9-inch springform pan with nonstick spray. Cook rigatoni noodles in a large pot of salted, boiling water until just al dente (slightly firmer noodles will be easier to work with). Drain noodles and transfer to a large bowl. Toss with 1-2 tablespoons olive oil, then add parmesan and toss until evenly coated. In a separate bowl, stir together ricotta, egg, salt, and pepper until thoroughly combined, and set aside. In a large skillet over medium-high heat, add marinara sauce and water, and heat to a simmer. Stir in Italian sausage, reduce heat to low and let simmer for about 15 minutes. In the springform pan, stand rigatoni noodles up on one end, making sure to fill any gaps with noodles, but don’t overcrowd. Pour the ricotta mixture over the noodles and spread it evenly, then add the meaty marinara sauce on top. Gently squish the cheese and meat down into the hollow spaces. Place springform pan in oven and bake for 15 minutes, then top with mozzarella and bake for another 15 minutes. Let cool for about 10 minutes, then remove the edge of the springform pan; use a knife to loosen the edges if necessary.